No. 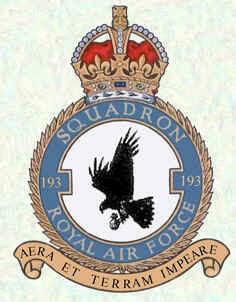 193 Squadron was formed at RAF Harrowbeer, England on the 18 December 1942 as a fighter/ground attack unit. Although designated to operate the new Hawker Typhoon, the squadron used the Hawker Hurricane until the Typhoon was declared operational in April 1943. In November 1943 the squadron was used to attack the German V-1 launch sites. The squadron then moved base in the south of England a number of times supporting the build up for invasion. From the 6 June 1944 the squadron was busy supporting the invasion force in the close-support fighter-bomber role. It was based on the Continent from 11 September 1944 as it continued to support the advancing armies in France, Belgium and Germany. The squadron disbanded on the 31 August 1945 at Hildesheim. Hawker Typhoon 1B in 193 Squadron markings, 1944. Some of the squadron's Typhoon aircraft were paid for by the Brazillian branch of the Fellowship of the Bellows, which were a loosely organised international groups formed during World War II to collect funds for the purchase of aircraft for the Royal Air Force. G G Jefford, RAF Squadrons, second edition 2001, Airlife Publishing, UK, ISBN 1-84037-141-2.